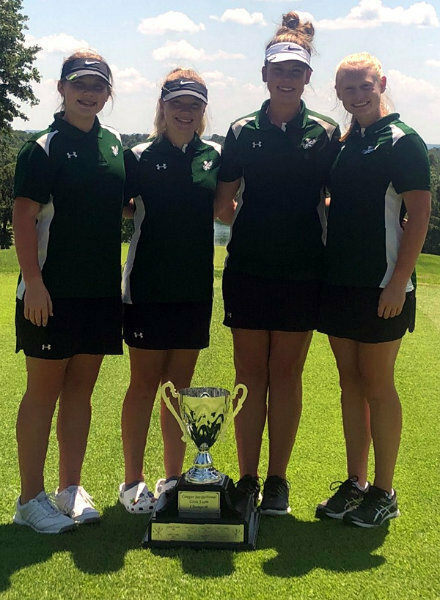 The Lady Eagles golf team won the Cougar Invitational played at Turkey Mountain and Cherokee Village golf courses over two days. Competing against school from 1A to 4A, West Side’s team score surpassed the runner-up by 60 strokes. This is West Side’s second time to win the title, and the Lady Eagles are tied for the most titles taken in the Cougar Invitational. The team is coached by Shane Davis. Pictured: The girls team includes (from left) Kortnee Finch, Kendra Harness, Kaylynn Finch, and Haley Gentry. The golf and other athletic schedules can be viewed from the WSHS athletics webpage.